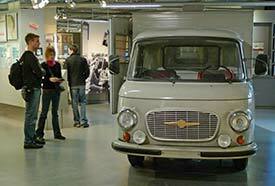 ABOVE: Visitors inspect a van from the DDR-Zeit, or GDR era. INSET BELOW: A sign reads: "Murder is murder even when it's ordered." The Zeitgeschichliches Forum in Leipzig, Germany--also known as the Forum of Contemporary History--is a visitor-friendly museum that "commemorates the opposition, resistance and moral courage shown in the GDR against the background of German division." The museum, which is located in the center of Leipzig, has a permanent exhibition that focuses on dictatorship, repression, citizen resistance, and events that ultimately led to the "Peaceful Revolution" of 1989. This exhibition draws on a collection of more than 3,200 objects, photos, and documents. The museum also stages temporary exhibitions (such as "Melodies for Millions: The Century of Pop Songs" during my visit) and organizes traveling exhibitions such as my own favorite, "Contemporary History in the Tram." To get an idea of what you'll see at the Forum of Contemporary History in Leipzig, go to the captioned photos on page 2 of this article. Also see our article on another fascinating museum in Leipzig, the "Runde Ecke" Stasi Museum and Memorial in the former headquarters of the GDR's State Security Service.